LOOK AT THAT BURGER! Just look at it! If you’re confused about what you’re looking at, that is one big honkin’ burger chocked full of deliciousness. It took Spring quite a while to get here, but we are FINALLY getting to enjoy some warm weather! We had a 40 degree swing in just a couple days. 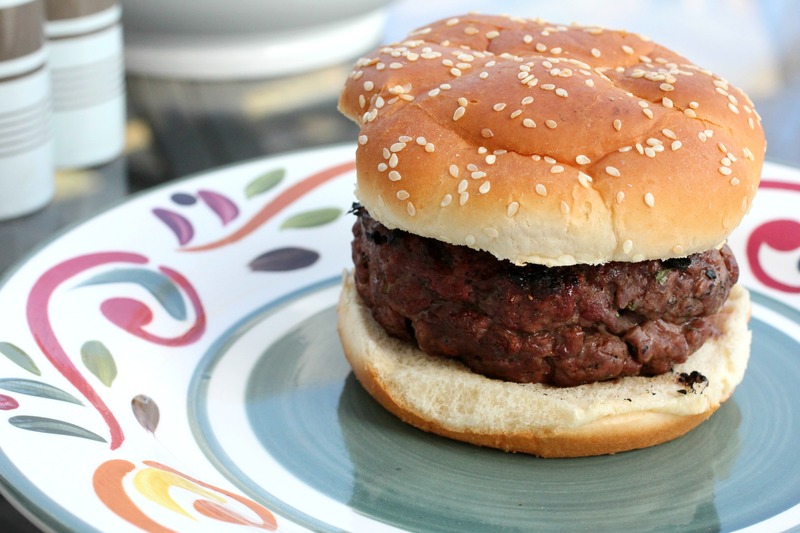 So in honor of brushing off the grill (and brushing the inch of pollen off of the outdoor table), we are starting the season off right with some unique burgers. Everybody (who is not a vegetarian) loves burgers. I am a big fan of the classic cheeseburger, but this was a really nice, indulgent change of pace, and I HIGHLY recommend it. I think my favorite part was the basil. It really permeated all of the meat, and gave it a delicious Italian flavor. But that gooey cheese is pretty great too. Funny story, they actually didn’t have fresh mozzarella at the store, so my husband bought some other cheese like “smoked cheddar and swiss” or something like that, and he didn’t really think it was that big of a difference. I told him that without the mozzarella, it’s technically not caprese. And after asking about 4 times, “are you SURE they didn’t have mozzarella?” I decided to just go with it. And ya know what, it was still amazing! 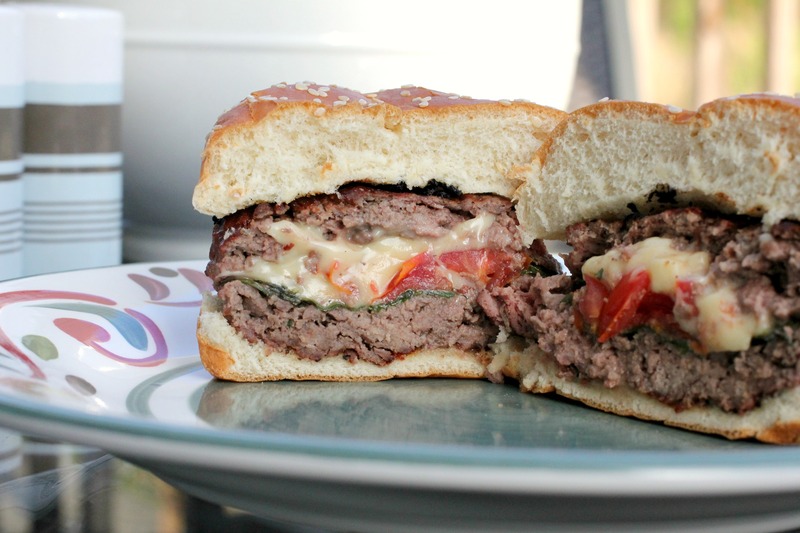 I think I might try experimenting with various stuffings for more of these stuffed burgers in the future! Let me know if you have any suggestions! Serves: 2 very large burgers! *Note: The amounts for the filling ingredients are approximate. You can adjust more or less according to your own tastes. 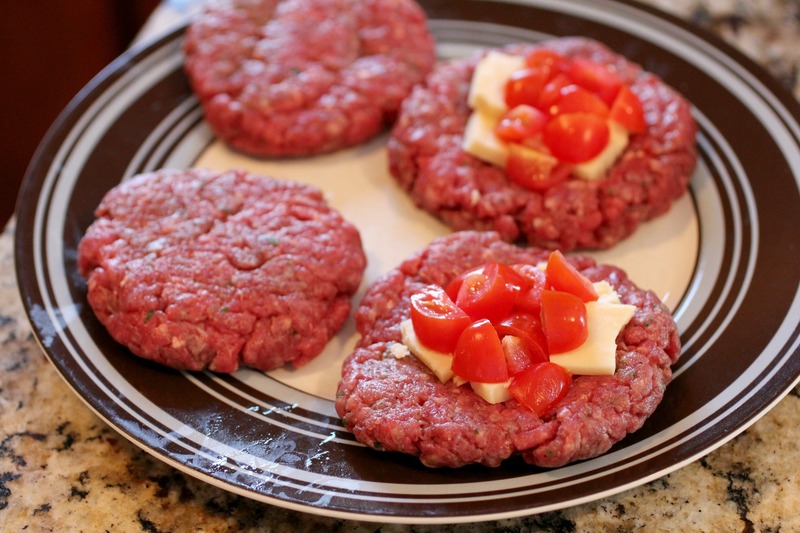 Season hamburger meat with your seasoning of choice, as you would normally make them. Flatten into 4 patties, making the center thinner than the outer edge (this ensures it will cook more evenly and hold in your filling). 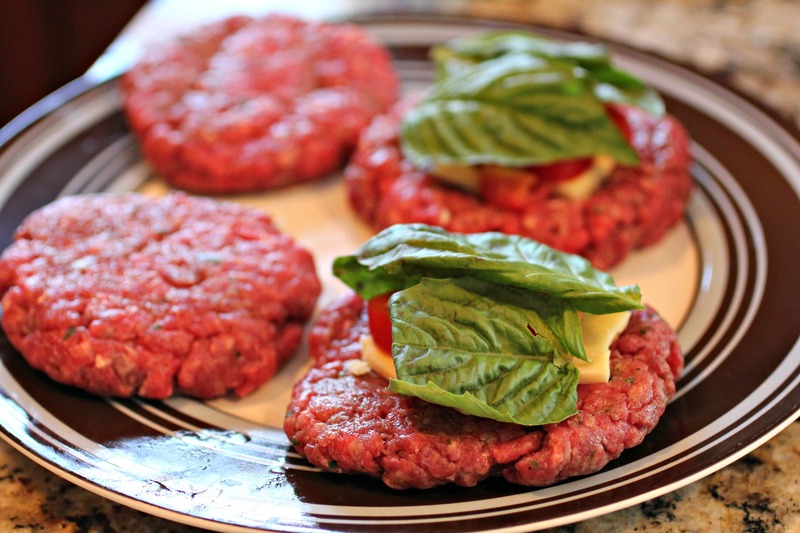 Top two patties with pieces of mozzarella, quartered grape tomatoes, and basil leaves. Take the remaining two patties and put on top of the filling to make a “sandwich” with the filling in the middle. Pinch together the edges to ensure that the filling does not fall out while grilling. Grill on medium high heat for about 10 minutes on each side. Serve on a bun with desired condiments. 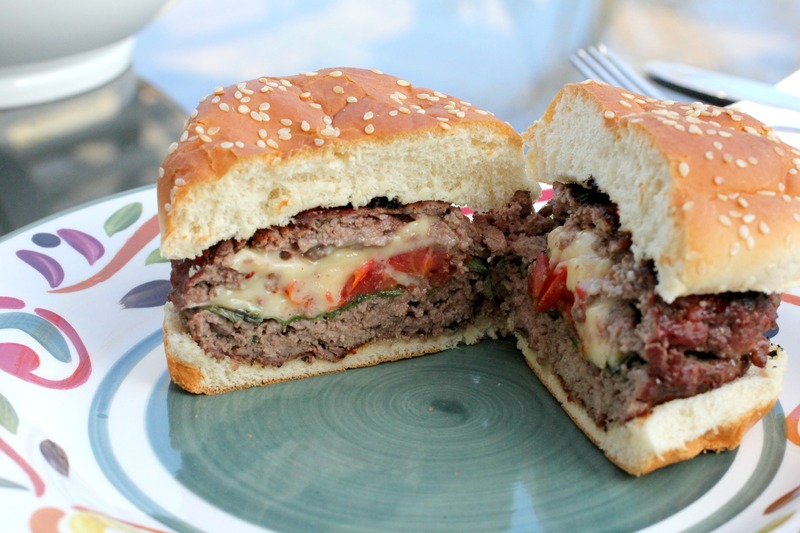 Oh YEAH – I’m gonna go out and buy some good ground beef just so I can make these…. my mouth is watering !! Do it! You won’t regret it! Perfect for a warm weekend! Big Mac sauce for the burgers. Thanks Kerri! Some Big Mac sauce would definitely be good on these…or any burger really! This recipe is a keeper, can’t wait to try it, Lindsay!!! Thanks!!! Absolutely love your website!!! Thank you for stopping by and for the sweet comment! Hope you like this awesome burger as much as we did! The relish in the bid Mac sauce is sweet relish. Sorry I forgot to say it.